Shows the apocryphal island of St. John east of the Philippines. 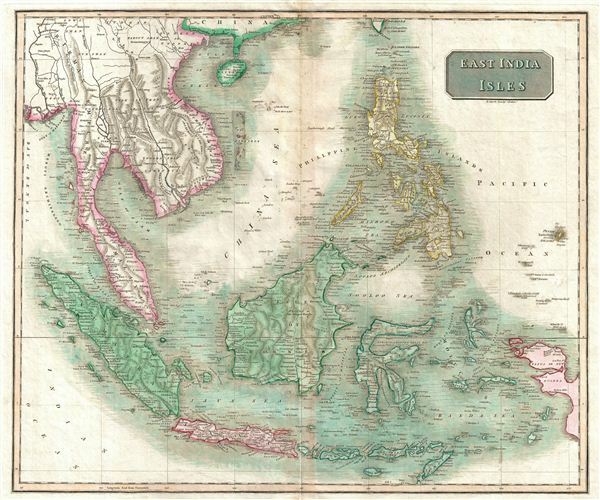 This is an exceptionally fine example of John Thomson's 1814 map of Southeast Asia and the East India Islands. Centered on Borneo, Thomson's map covers from China and Hainan south to Sumatra and Java, and eastward as far as the Philippines and New Guinea. Includes the Pearl River Delta at its northern most edge and names Macao and Lantao Island (Hong Kong). The Singapore Straits are identified, as are Bintan and Batam Islands, but the Island of Singapore itself is unnamed. Just to the east of the Philippine island of Mindanao, sets the apocryphal island of St. John's. The fiction of St. John's Island probably originates with the Portuguese cooption of manuscript mappings of this region acquired form Magellan expedition, though it's first published reference is in Ortelius' 1570 Asiae Nova Descripto. Following St. John's appearance on Ortelius' maps numerous mariners, including Dampier, claimed to have visited it, however, most were most likely mistaking it for other islands in the region. Over the years the location of St. John's Island thus migrated westwards towards Mindanao's eastern coast where it resided until about 1850, when the island finally disappeared from cartographic record. In later editions this map Thomson annotates St. John's island with 'Doubtful,' but in this early edition, at least, he seems quite confident of its placement. The whole of this map is beautifully engraved in the minimalist English style pioneered in the early part of the 19th century. Relief is shown by hachure with towns, roadways, cities, and major topographical features identified. This map is a steel plate engraving by T. Clerke and was prepared by John Thomson for inclusion in the 1817 edition of Thomson's New General Atlas. Thomson, J. A New General Atlas, (Edinburgh) 1817. Very good condition. Original centerfold exhibits some minor discoloration. Some offsetting. Original plate mark visible. Blank on verso. Rumsey 1007.043. Phillips (Atlases) 731. Newberry Library: Ayer 135 T4 1817.